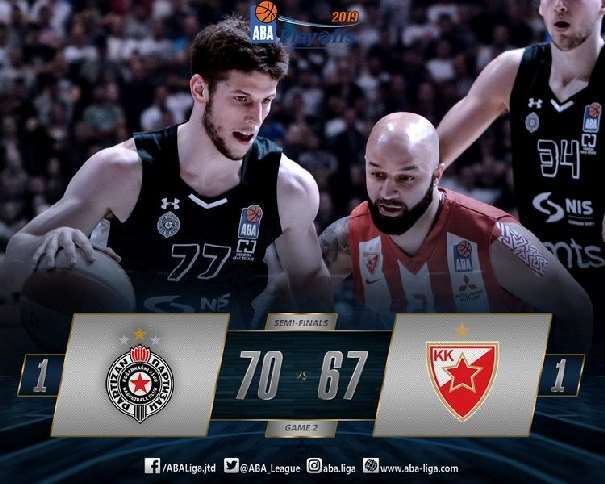 In the ABA League second semifinal match between Partizan and Red Star, The Black-Whites won 70 – 67 in the Aleksandar Nikolić Hall and now the tie-break game next Saturday is going to decide which one of these 2 teams will be one of the 2 finalists. It will be a “do or die” match, because the stake is really big: a chance to fight for the trophy and the chance to play the next season EuroLeague. 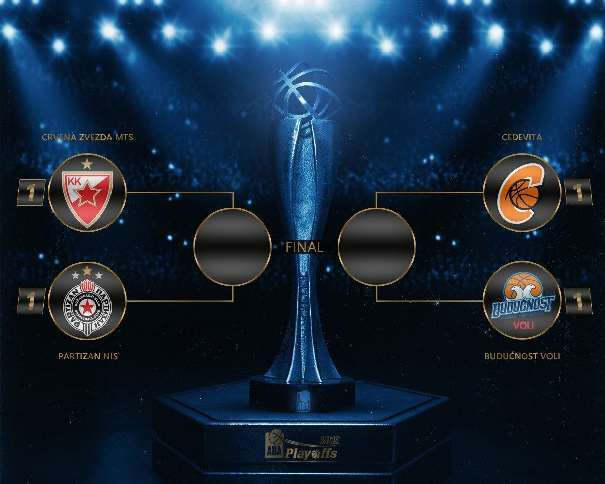 The second goal is the most important one for all the four teams (Crvena Zvezda, Partizan, Budućnost and Cedevita) who are playing the semifinals of the regional league. In a packed Pionir, the crowd was able to see a defensively excellent match, with less points than in the previous one, when The Red-Whites won with a score of 106 – 101 (in the Overtime, after the 85 – 85). The second game of this semifinal was a totally different atmosphere, it was Partizan home court and the hosts were playing their basketball, not allowing the opponent to score easily. The First quarter finished with a score of 13 – 9 (+4), and for about 6 minutes in that quarter, Zvezda was leading by 3 (2 – 5). 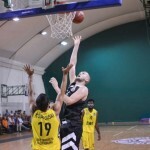 After the empty minutes from both parts, Partizan captain, Novica Veličković, scored for the 4 – 5 (-1) at 4:02 before the end of the quarter, and the next points were scored by Bandja Sy at 2:41, for the first lead of the home squad (6 – 5, +1). And the last points in the first 10 minutes were scored by Rade Zagorac, who made a three pointer on 0:01. The second quarter of the game was more interesting because both teams started to score and the last points (a 2 pointer) in that quarter were scored by Jock Landale, from Partizan, on 0:01. The result after this second quarter was 34 – 27 (+13) for the hosts. The Third quarter belonged to the guests, they got back in the match totally and turned it all around. The Red-Whites were scoring and, at the end, before the last quarter, they were leading by 1. The Score was 48 – 49 for Zvezda. The Guests scored 22 points, while the home squad was stopped at 14 in that Third quarter. In the last quarter Zvezda lost one of their key players, Stratos Perperoglou, due to his second unsportsmanlike fault (against Jock Landale) in the 33rd minute of the match (the first one was in the first half when the Greek player punched Rade Zagorac in the head with an elbow). In that moment his team had the play and the score (53 – 58, +5 for The Red-Whites). But then, Partizan started to get back in the match and in the 37th minute of the game had the lead (65 – 62, +3). Marcus Paige score an important three pointer in the 39th minute for the score of 68 – 64, but, then, Billy Baron returned it (68 – 67) after a Vanja Marinković’s turnover. They were the only three pointers these two players scored in this match. And Paige marked the game scoring two free shots (70 – 67) because Dejan Davidovac, from Zvezda, missed the Red Star chance for the overtime on the other side. After the match Andrea Trichieri congratulated his team on the win and compared the American player Paige with Godot from the Samuel Beckett’s play “Waiting for Godot”. “Marcus Godot Paige! Sometimes when you constantly believe in something will give you expected result. Even though at the beginning nothing good happened, I trusted in him a lot. I allowed him important shots. He scored the most important. But, offensive jumps were crucial”, said the Italian coach after the match. And when one of the journalist told Marcus about the press conference highlight moment, Paige didn’t read the play so he wasn’t able to understand well what coach said but he promised he will read it. After the win against Zvezda in this second semifinal game the Partizan players Jock Landale and Alex Renfroe were satisfied with the win. Landale was satisfied with the great job his team did in the last moments of the game. “In some way I was lucky, the ball was going at me, so I picked it up. I was happy my teammates were near me, I threw the ball at them hoping for the best and Marcus (Paige) was at the right place. We had the chance to finish the match before, but we didn’t. Now, we put them in the situation where there we want them to be and I think we are able to the same thing next week. Only one game left and I’m fine with that”, said Landale who was modest enough after an important win against their neighbour rival. Renfroe was also satisfied with the victory and after the match he was already thinking of what he could improve. “We won, that’s what counts. There are lot of things I can improve in every segment of the play, but I am happy we won. It was our goal. I think individual performances are not important after the victory” started Alex who made an amazing block against the German player Maik Zirbes from Crvena Zvezda. “That was nice, Zirbes will feel that tomorrow. It was nice, I am very happy it finished that way. It could go the other way, but it didn’t. And I didn’t think it was fault, nor the referees, they didn’t make that call. I can live with that. We are very pleased because of that and because of the victory. When I saw that he was going for easy dunk I couldn’t let him. Sometimes you succeed, sometimes you don’t. It was my chance and I took it. Luckily, it was a block and not points plus free throw”, said Renfroe after the match. Partizan, from Renfore’s perspective, has to be focused and modest in the next game against Zvezda. “This is basketball, it has to be with ups and downs. We already made some mistakes by letting them make easy baskets. 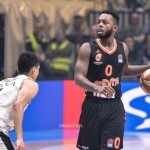 That can happen to anyone, but we need to stay focused in every part of the match and we must control our game”, finished the still 32 years old American Point guard – Shooting guard. Partizan captain, Novica Veličković, said to the press that his team could finish the game much earlier. “We gave our best in the game with a lot of tensions. It was usual derby. It was very stressful for the all participants (fans, etc.) and especially for all of us who were playing. Yes, we could finished it earlier, but victory is victory. We have seven days to prepare for the next game”, said Novica after the game on Saturday. Partizan captain was injured during the first game and his appearance in the second was questionable. Not for him. Veličković was on the court with all his teammates and without a dilemma. “Yes, I was playing with some sort of bandages, but little bit stronger. In the end everything went well, and that what’s counts. For me there wasn’t any question if I was going to play. I think my team needed me and in those situations some things you put aside. It wasn’t easy, I wasn’t playing totally without fear, but I have already told that I would do anything for the team. It wasn’t difficult decision at all“, said Veličković. Marcus Paige wasn’t the best player on the court during the second semifinal against their The Red-Whites neighbours but he was, definitely, one of the heroes of the match. “I had a problems with my shot in the past few weeks, and I was trying other things to fit in the best possible way in offence. I was used to score and I was starting to ask myself what is happening. But, I still have a lot of self-confidence and our coach trusts me. Instead of trying too hard to find my old rhythm, I decided to be relaxed. 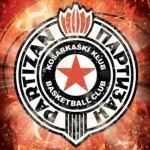 The coach draw some actions, and I scored”, said Paige who also mentioned Partizan fans. “Our fans are amazing. We knew this time will be different. In the previous game both team scored 100+ points, and this time, during almost whole half result was 5-2. We expected this kind of match. We made some good decisions in attack, Jock had some rebounds in offense, I scored free throws and we did some small things that decided the match”, said Paige who wasn’t familiar with the play “Waiting for Godot”. During the press conference his coach, Andrea Trinchieri, add the middle name Godot to his real name because he wanted to mention that some miracles will come if you wait them. “No, I don’t know the phrase Godot. I have never read that play but in order to understand what coach wanted to say I will have to read it, definitely”, finished the American player.